You are currently browsing the tag archive for the ‘Daniel Krucoff Photography’ tag. Ever since Dan & I married, even before that, we have been a collaborative, supportive team. He is my best friend and soulmate. He is honest, caring, and one of those idea people. I love him with all my heart and soul. He has influenced my work, new projects, and creative directions. As we journey through this life together, we have always wanted to do a joint show. Now that has become a reality for us. On Friday, July 21, 2017, Immersion opens at Commonwheel Artists Co-op in Manitou Springs, CO. The concept for this show came from Dan. We love water’s qualities and its associated locations. Through this exhibit of our respective art works, we hope to convey the feeling of being surrounded by the beauty of the ocean, lakes, ponds, streams and waterfalls. Dan has captured so many moments in time with his photography. Breathtaking ocean waves as they crash against the shoreline rocks, the Milky Way at Bandon, Oregon. During his local hikes, he encounters the occasional character willing to pose. I feel so blessed to have been with him when he photographed many of these scenes. 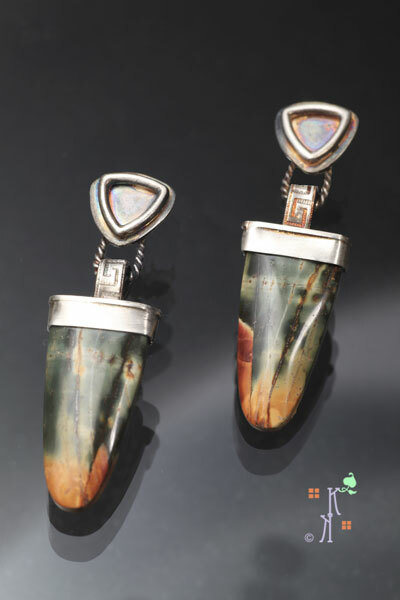 As I worked on jewelry for this exhibit, I developed a completely new body of work. I incorporated stones the lent themselves to the imagery of water, waves, coral, shells and more. It’s the first time I have felt so completely free creatively that many of my works evolved in their own direction. Only a few started with designs that remained until completion; most became free form fabrication that I have never done before. Perfection and symmetry were not goals because I wanted to give my impression of the natural essence of water. Dan & I are blessed to have found each other. We share a unique relationship based on love, friendship and mutual respect. Immersion will give the audience a glimpse of our life together and our artistic souls. If you live in the Colorado Springs area, I hope you will be able to join us. The exhibition runs from 7/21 – 8/14/2017. Until next time, I aspire to be more as an artist and a person. Returning to the Dendritic Opal stone family with this piece. Dendritic Opals were the original inspiration for this series. A family of tree shapes take up residence around this lovely stone. This time I added a small silver accent in the upper left corner as a representation of the sun or moon, depending on one’s mood. Set in sterling silver that I’ve oxidized with a liver of sulphur application. The dendrites formed a solitary tree a bit off-center in this stone. As I looked at the finished piece, it spoke to me about a moment captured in time. The kind of thing that happens every time we take a photograph. That instance is preserved on film or digitally; a second of frozen time. As I thought about this, Time Stands Still seemed to be an appropriate title for the piece. I like the small stone in this setting as I think it conveys a sense of delicacy, making this a very feminine piece. Until next time, aspire to be more as an artist and a person. Now if you had asked me in high school what I thought of science experiments, I would have told you that I didn’t care for them at all. It just seemed like I had way too many failures in the lab. Sulphuric acid ate holes in my clothes, dissecting frogs was just unpleasant and I just didn’t enjoy it. Scientific experiments…well, that just wasn’t my thing….then. However, since then, I have learned that there is great value in being willing to experiment. The rewards from experimentation vary, yet I am finding the frustrations I encounter when experimenting with my metalwork can ultimately yield some wonderful results. As my sister Lex likes to say, “Creativity begets creativity”. Continuing with the theme of my last post, these earrings represent another experiment of mine with how I attach components. Instead of the typical use of jump rings to join components in a piece, I decided to try twisted wire and a patterned wire to join the top metal component to the stones. Dan really likes the result with this pair of earrings. The stones are Cherry Creek Jasper. 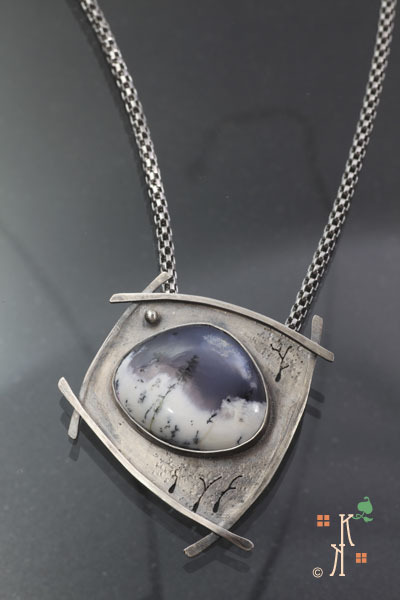 Ever since I completed my first setting of a tongue type stone shape in Namaste, I have been fascinated with the ways to create something unique when combining two or more sections of jewelry. These earrings have sterling silver posts. I tried a different approach with the oxidation, working on more color. Another experiment on my part. One of the prinicples that Lexi has taught me about making jewelry is the importance of movement in a piece. These have a nice ‘dangle’/movement quality and they are just plain fun to wear. Light weight, nice movement, along with the interesting ‘shapes’ I see in the stones. As is my pattern, those shapes reminded me of Forest Canyons, so that is how the name for them was derived. The process of experimentation can actually be very freeing. At least that is my experience with it. I find that I am embracing the process of experimenting. Sure there are failures, I have come to understand that is expected in this process. Yet the rewards…aaaaahhhhh, the rewards are so worth the risk of experimenting. And as Lex likes to remind me, it’s only metal. So jump in, the waters of experimentation are just fine. You will enjoy it. Trust me. It’s true.